Evelyn Herring, 95, passed peacefully on Thursday, November 29, 2018 surrounded by her adoring family. Evelyn, born June 29, 1923 in Toledo, OH, was the only daughter of Wallace and Lillian Weber Stough. She grew up with six brothers who greatly shaped her character. A graduate of Woodward High School, she married the love her life, William Herring, on February 7, 1942. 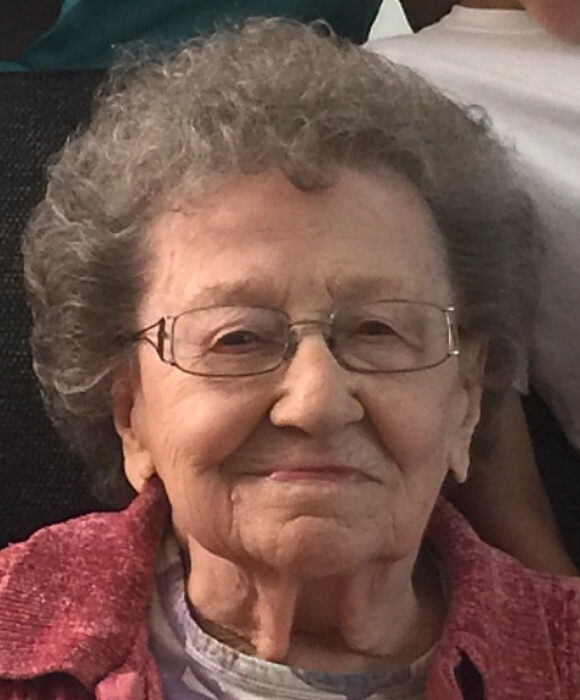 In her early working years, Evelyn worked in the office of Dr. Bayer at Reynolds Corners in Toledo and later for many years in the Sylvania School system as the kitchen manager at Hillview Elementary until retirement. She was a member of Heritage Church of God on Strayer Road. She was well known in her church community for her delicious pies and never used a recipe to create them. Mother so enjoyed her many, many dogs and cats over the years and each one was so special to her and her husband Bill. They both had a special compassion for all living things. Evelyn loved photographing her family and spending time in her garden, but most of all doting on her children, grandchildren and great grandchildren. She was preceded in death by her parents; her husband of 67 years, William Herring, in 2009; brothers George, Leland, Robert, Edward, Eugene, Ronald “Jack” Stough; grandson Joshua Herring; great grandson Evan Carroll; daughter-in-law Barbara Herring; son-in-law John Heinrich; and best friend Rosemary Probert Burditt. She is survived by her children Judith (David Orlich) of California, David, Sr. (Margaret) of Maumee, Lisa Heinrich of Holland, OH, Mark (Dawn) of Lambertville, MI; grandchildren Matthew and Heather Luce of California, David Jr. (Tina) of New Jersey and Nathan (Nicki) Herring of Virginia, Jonathan (Christina) and Alex Herring of Toledo, and Joseph Sheamer of Sylvania; great grandchildren Ewen and Eli Luce; Ella Carroll; Jacob and Emily Herring; Aidan, Carter, Liam and Gavin Herring; Wyatt and Layla Herring; and Ethan Sheamer. Commemorative donations can be made to Evelyn's favored charities being Toledo Area Humane Society, Humane Ohio, Paws and Whiskers or Nature's Nursery. Visitation will be held at Reeb Funeral Home, 5712 N. Main Street, Sylvania, OH, Tuesday, December 4, from 4pm to 8pm. Services will be held Wednesday, December 5, at Reeb Funeral Home at 11am. Interment at Toledo Memorial Park to immediately follow.